All images are for illustrative purposes only. Actualproduct may vary due to product updates. An invigorating and nourishing conditioner suitable for normal and oily hair types, formulated with Organic Tea Tree, Aloe Vera, Shea butter, Panthenol, Sunflower oil and Vitamin E. Used in conjunction with Dr Organic Tea Tree shampoo this incredibly effective formulation naturally improves the condition of the hair by coating and penetrating the hair’s external fibres and cellular keratin matrix to purify and revitalise. If your online order is over BHD 20 & paid online we will ship your order free of charge in Bahrain. For all other orders in Bahrain a BHD 1.2 => 1.5 shipping fee will apply. Also we are shipping worldwide. 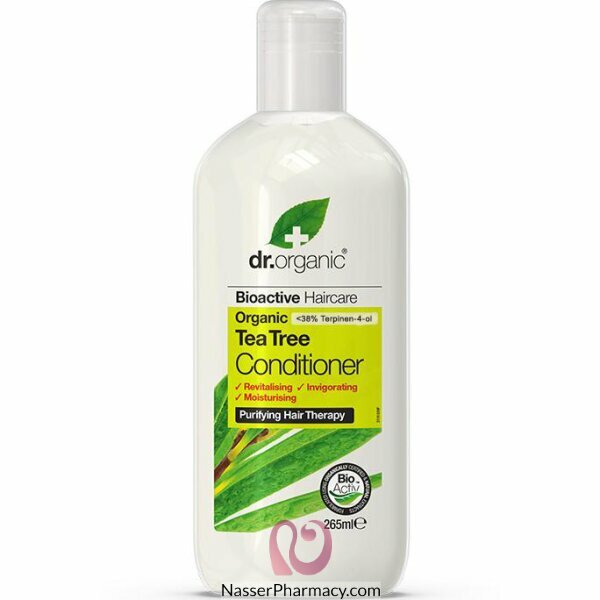 DESCRIPTION :This stimulating shampoo cream is the perfect complement for anti-hair loss treatm.. Description:specially formulated to provide vital nutrients required for healthy looking hair. They .. Adjuvant to the treatment of excessive hair loss, for men and women.Stimulates hair follicles and no..
Use it just twice a week in between your regular shampoos..
EXPIRY DATE :AUGUST 2019This formula is designed to help support collagen, a major component of skin..
EXPIRY DATE AUGUST 2019This formula is designed to help support collagen, a major component of skin,..
Desrciption:Aminexil, an effective pharmaceutical molecule that combats hair loss, is the fruit of 1..
Jowaé Moisturizing Light Cream 40ml is a moisturizing cream for the face, based on antioxidant Lumip..
DescriptionSince 1947Delicious, Easy to Absorb FormulationMay Reduce the Risk of Osteoporosis†Gluten..
50 ml TubeVery high protection for sensitive skin.Effective against all sun radiation (short and lon..
Zinc promotes healthy skin, hair and nails and supports normal taste and vision. It exerts antioxida.. Description:an anti-ageing skin rejuvenation booster that accelerates skins natural repair process, ..
Benefits:At the heart of all Avène skin care productsClinically shown to soothe, soften and calm ski.. Description:A hydrating, anti ageing, regenerating oil that restores and balances the skin and sense.. Description:Used in combination with our organic bioactive Lavender shampoo, this incredibly effecti..
DescriptionSince 1947Promotes Healthy BonesNon-GMOGluten, Wheat & Dairy FreeHalalCertified-Glute..
100 ml TubeVery high protection for sensitive skin.Effective against all sun radiation (short and lo.. Description:50 ml Pump tubeVery high protection for normal to combination skin.Effective against all..
Magnesium is a poly-active major essential mineral. Magnesium helps to regulate calcium transport an..
At Nasser Department Store and Pharmacy, we pride ourselves on reliability and dependability when it comes to your health, beauty and medical needs. We constantly strive to discover top-quality products, keep up to date with latest research and advancements in technology to ensure you get the best possible products and advice to start or maintain your heath journey. We invite you to join us by visiting any one of our branches, shop online with us now and when you are ready, sign up to our Loyalty ProgramsFor more information, visit our corporate site at Bahrain Retail & Corporate Information. Get our promotions first hand!